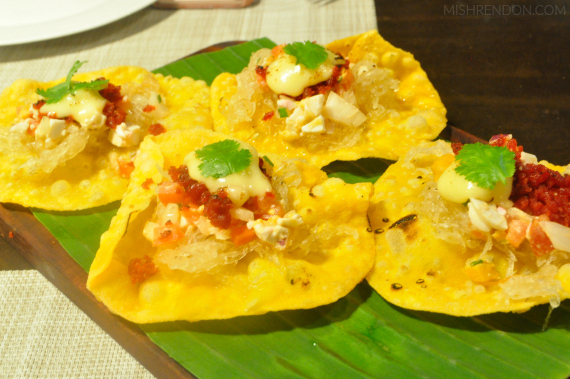 I was in Tagaytay a few weeks back for a series of events, one of which was a trip to a relatively new Modern Filipino restaurant - The Lake District. I think visiting The Lake District was very timely since it was raining hard that night and when experiencing such weather, nothing beats comfort food or home cooked meals. 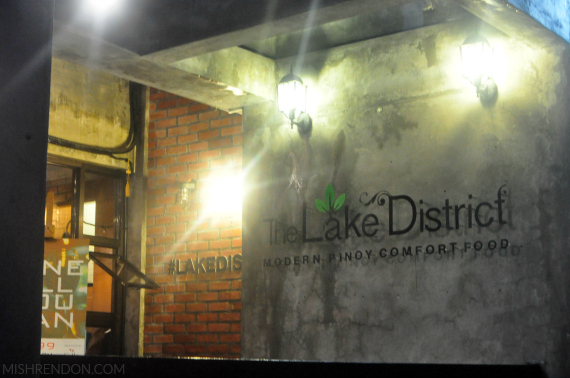 The Lake District has a modern rustic interior - brick walls, contemporary fixtures, and comfortable seats. 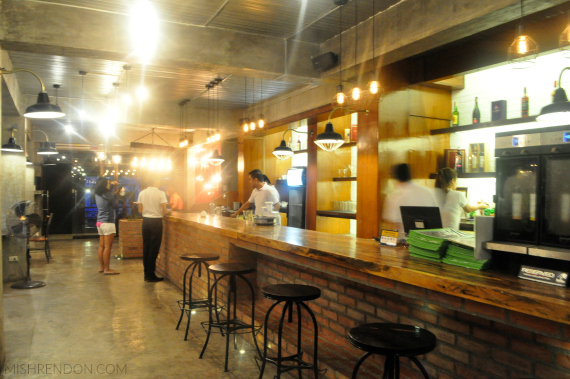 I personally love their spacious bar. There's also a spot near the restroom consisting of a red wall filled with lights where you could do a mini photoshoot (which we did). Fave place in the restaurant - the bar! This dish was definitely a conversation starter. 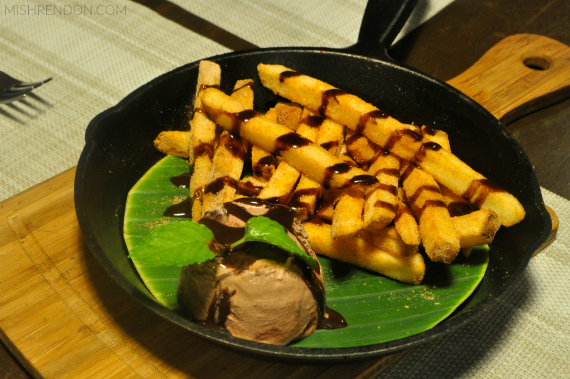 The fries are tossed in The Lake District's signature blend and drizzled with sauce made with Batangas tablea and served with ice cream on the side. I personally eat my fries with ice cream when I dine in fast food establishments so I didn't find it hard to eat this dish, but their version was way better. It was an unusual combination but everything amazingly seemed to go well together. I honestly fell in love with this dish. Deep fried empanada crusts were fried and topped with atchara, itlog na maalat, tomato salsa, recado longganisa, and cheese. It offers a variety of flavors - sweet, salty, and sour - in one bite but it was remarkable. This one's for sharing but I could definitely finish the entire serving because it's that good! 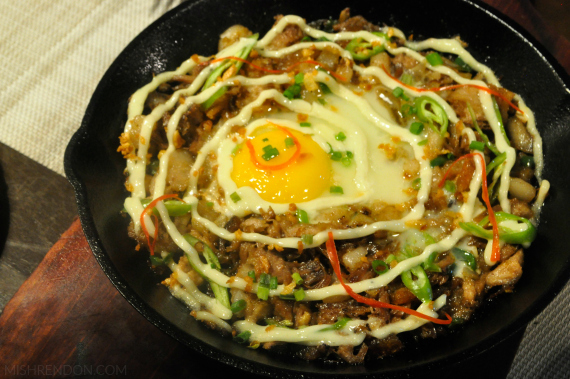 No bar chow menu would be without sisig and The Lake District's version is a winner! 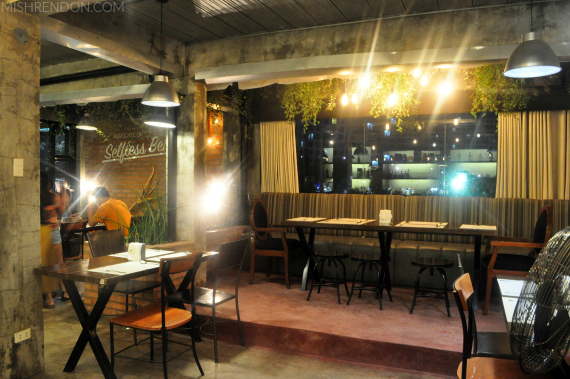 Their version consists of crunchy pork sisig served with wasabi mayo. I know this one's an appetizer but I would definitely have this with rice. The Lake District's Porchetta is to die for! The crispy skin was heavenly, the belly fat just melts in your mouth, and the liver sauce simply completes everything. It's actually quite tedious to prepare this dish. 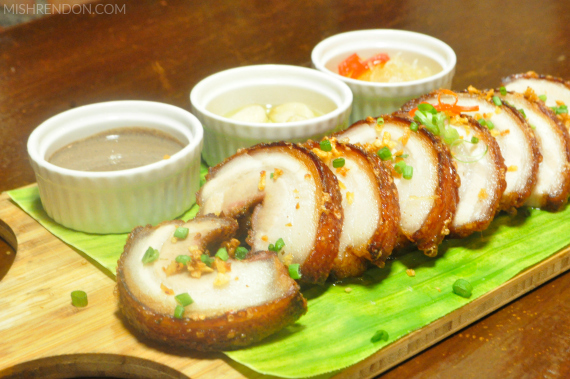 Pork belly is rolled and stuffed with herbs and spices inside. It is slow cooked and thereafter deep fried to achieve that perfect crisp. Their version is served with herbed garlic confit, atchara and their signature liver sauce on the side. I can still imagine how this dish tastes like - buttery good! 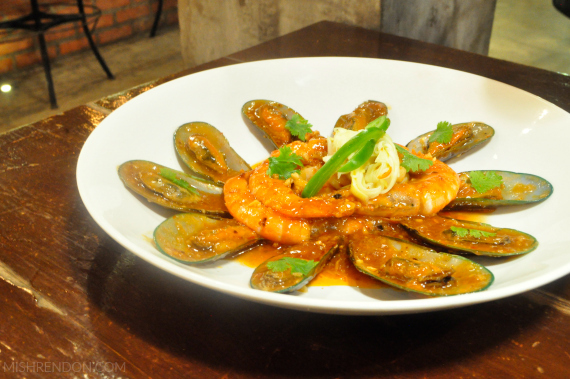 This seafood platter consists of a mix of shrimp, mussels, and squid stir fried in garlic and sweet chili sauce. The sauce was absolutely delicious that I topped some over my rice. This one is not your ordinary ribs dish. 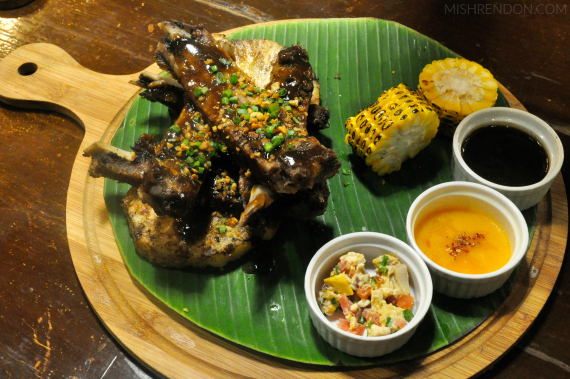 The pork ribs with adobo sauce are slow cooked and grilled and served with grilled pineapple slices marinated in rum and cinnamon, among others. This dish does not only look pretty, but it tastes great! I mean who would say no to adobo or ribs? 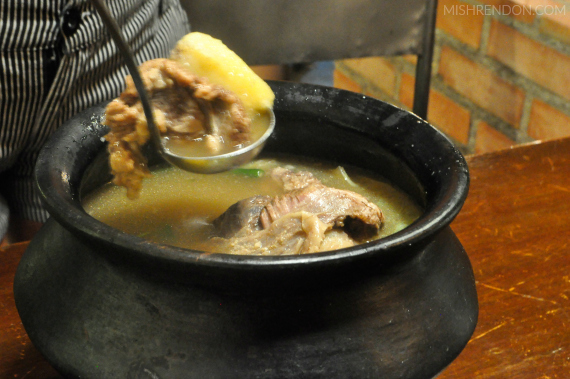 A trip to Tagaytay would not be complete without having their signature dish - Bulalo. I am glad that The Lake's District version of the classic Tagaytay Bulalo did not disappoint. It was everything I imagined. The broth with a mix of celery, potatoes, petchay tagalog, cabbage, corn, and saging na saba was flavorful. The meat was really tender that it literally melts in your mouth. I was looking for the marrow from the container but someone must have taken it already lol! After everything that was served to us, I just couldn't say no to dessert! First up was the Lake District Chocolate Truffles. 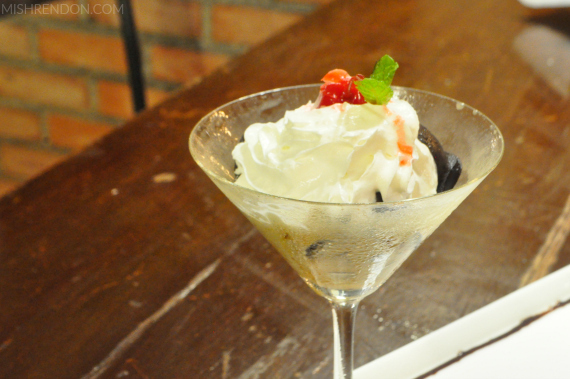 It consists of chocolate ball made with crushed oreos, cream cheese, coated with chocolate ganache, served with caramel sauce and vanilla ice cream on the side. 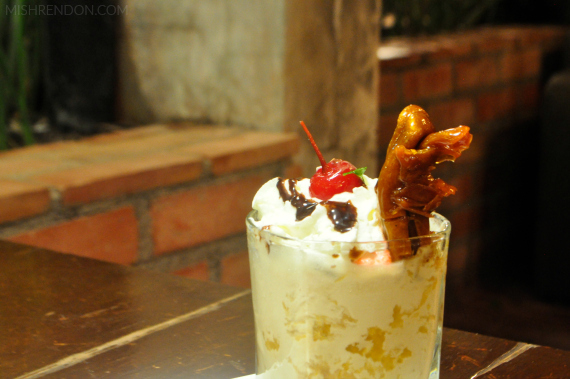 Another unique concoction was this combination of two of the most popular produce in Tagaytay - coffee and pineapple. I thought this would be weird together but I've been surprised enough the entire night that anything that comes out of the kitchen, whether it be something I know or not, I expect them to be awesome and they turn out to be such.